Wendy Watego and Vicki Scott really understand the idea and practice of partnership. STARS Institute of Learning and Leadership is a not for profit organisation that seeks to provides services to both individual First Nations people and people working with them, as well as organisations who want to ensure their vision has the buy-in of their most important resource – their people – and that there is nothing in the way of their people contributing to that vision. With Wendy’s background in education and Vicki’s expertise in government, it wasn’t always going to be a guaranteed business partnership success. Despite being relative novices to small business, their individual and joint persistence and a willingness to look hard at themselves, has enabled this on-the-surface odd couple, to gradually develop a clear goal and strong business model. Now that Wendy and Vicki are in their sixth year and with their first book on its way to the publisher, what advice do they give others who are getting ready to embark on the same journey? Be very clear on what your vision is, and why it is important to you. Make sure you are passionate about what you are doing, and not just looking for money. This will sustain you in the quiet times. Ask yourself “what is the impact on you if you don’t follow your passion and dream”. Do your due diligence – make sure there is an identified need, a gap in the market and how your business will fill that gap. Be very clear on why you are unique, and identify anything you think might stop you from achieving what you want. We understand the importance of building a supportive environment that also acts as a benchmark for successful businesses. Wendy and Vicki’s business is about working with individuals and communities to assist them to get rid of beliefs that limit their possibilities. But as savvy business women, they also work on themselves and their business. With empowering beliefs abounding, the sky is the limit. CJ’s Island Pizza (CJs) is located on North Stradbroke Island which has a local population of approximately 3,000 residents. Access to the island is by vehicle barges or passenger ferries. The island is a tourist destination boasting some of the best beaches in Queensland, great surf, excellent fishing, extensive camping and holiday accommodation and a rich history of European settlement and a continuous Aboriginal culture​. Although the focus of CJ’s business plan is the local population, tourism or visitation is an important component of its ongoing viability. Poor weather, natural disasters, like the severe bush fire right in the middle of the high season, and rising costs to access the island present a number of obstacles for business. If you have got a great idea, certainly do your research, test your product or service if you can, make sure a lot of “somebodies” will want to buy your product or service, get yourself a business mentor, join a local business network, plan ahead and stay focussed on that plan, work hard and have some fun. Make sure your business becomes part of your life and not something you do separately. Creating and maintaining a locally driving business raises many challenges. Like cooking a great pizza, Charlie and the whole CJ’s team have spent time working on their recipe and building a great base. We look forward to seeing the next stage of the pizza delivery business journey. Image credit: Supplied by CJ’s Island Pizza. 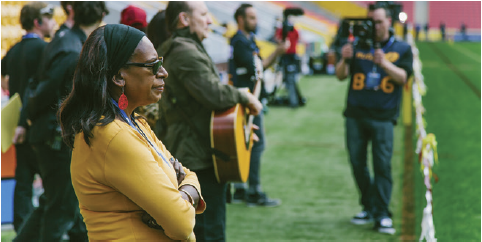 Staying employed, maintaining ambition, and being in it for the long haul are just part of Nancy Bamaga’s business journey as the CEO and Managing Director of Black Drum Productions. To be successful you must be ambitious, have passion and stay committed. Discipline and motivation are essential. Black Drum Productions has been a part of the Brisbane Creative Industries landscape for over a decade, and provides an independent and innovative service within a small but growing niche. The other aspect to success for Nancy, has been the importance of networking. Owning a business has helped to define Nancy and her commitment to Indigenous arts locally as well as regionally. Black Drum Productions is a reflection of over a decade of committed work amongst Queensland Indigenous communities, and is definitely a legacy she can be proud of. What will the budget bring Indigenous business? Last month, the country waited with baited breath, listening for what the future holds for their respective interests as the Federal Treasurer, Joe Hockey handed down the 2014 Budget. As we analyse the outcomes, we are asking ourselves, is the Commonwealth Government’s commitment to Indigenous business clear? While the Treasurer has committed to removing red tape in regulation, meaning for some Indigenous business owners a greater opportunity for improved productivity, there’s yet to be any indication of new or innovative programs that support for emerging and established businesses. And while the existing Indigenous Business Australia programs, including the successful Into Business workshops appear to be ongoing, it will be interesting to see if there is any additional support available for grassroots Indigenous business groups such as Indigenous Chambers of Commerce. Establishing and maintaining membership-based Indigenous Chambers is not difficult, but it does require some resourcing. Unlike “mainstream” chambers, few of our members are established enough to provide the financial support base needed to keep up the ongoing work of fostering trade, building capability, advocacy and generating wealth. We also note the importance of networks in the success of Indigenous businesses in the Success Factors for Indigenous entrepreneurs and community-based enterprises Resource Sheet by Sam Morley published last month. Now that the budget has been handed down, it is still a long way off being clear if membership and regionally based Indigenous Chambers, those made up of ordinary Indigenous business owners will see anything coming their way in the short term. In the meantime, we, many of us volunteers, will continue to function and work for our members as best we can.